Due to their relatively small size, even texture, and great flavor, trout are a perfect fish to hot smoke. Hot smoking cooks the trout while it adds that great smoky flavor. This is different than cold smoking, which is used to preserve fish. Smoked trout make a great meal or appetizer. It can also be used to flavor many dishes, from fish soup to smoked trout dip. Best of all, the process is relatively simple. To flavor and moisten trout before you put them in the smoker, you can start with a brine. It's easy, requires just a few common ingredients, and the fish will be ready by the time you get the smoker going. This is an optional step and smoked trout don't necessarily need a brine. 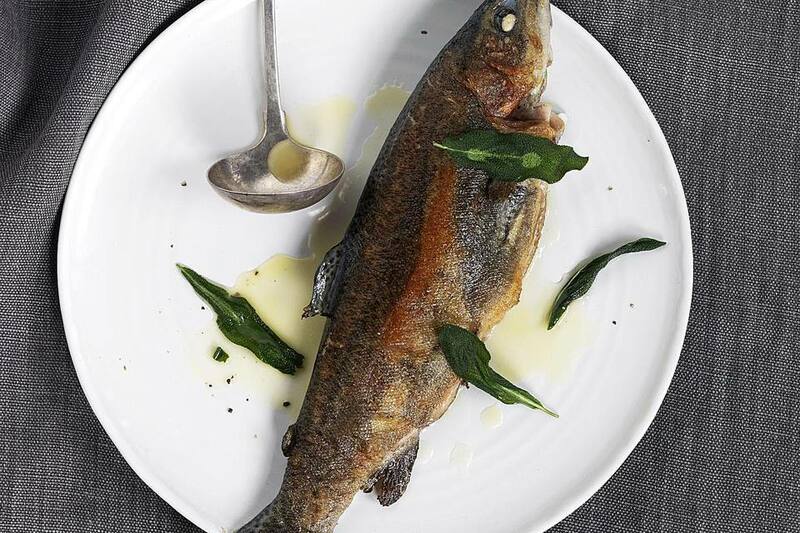 To brine trout, combine about 1 tablespoon of table salt or 2 tablespoons of kosher salt for every 1 cup of water. You will need to prepare enough brine to completely cover the fish. Adding small amounts of seasonings to the fish brine is a great idea as well. Keep it simple with things like onion, garlic, and black pepper, along with a little vinegar and olive oil if you like. You will need to clean the fish and have them ready for the smoker before you brine. Once prepped, simply lay them open so the brine can get inside, then pour the brine over the fish. While the trout brine, you can prepare the smoker. Small trout (about 8 inches) can be completely smoked in as little as an hour but more time will add extra flavor. Watch the fish so they don't dry out, but you can typically leave them in the smoker for up to 4 hours at a temperature around 225 F.
Use a mild wood like a fruit wood or oak to smoke with. Traditionally, alder is used with fish and if you can get some, it makes a great smoke flavor. Try to place the trout in such a way as to let the smoke get to the insides of the fish. Once the trout is smoked it will be easy to remove the bones because the slow cooking process helps to separate the meat from the bones. Once the trout is completely smoked, a tasty meal is ready for you to enjoy. You can eat them just the way they are, making them a meal with your favorite sides. You can also use the smoked trout almost like smoked salmon as an appetizer or an ingredient in other dishes. A recipe you might want to try combines 1 cup of smoked trout meat with 2 cups of cream cheese. Season this with garlic and Tabasco and serve it as a dip. People will love it. Smoked trout can be frozen for months or refrigerated for days. Remember that this fish isn't preserved and if you don't do something with it right away, it needs to be refrigerated. If you plan to freeze the smoked trout, it's best to remove not only the bones but the skin as well. You should keep only the meat of the smoked trout when freezing it.